I have to say that I was really impressed with Thalassa. It’s a Greek restaurant that’s in a building that’s owned by a shipping company and has been there for the last I don’t know however many years. It seems like if you own the building, you’re going to have a better possibility of being able to manage a restaurant at the bottom of it, but the food here speaks for itself. 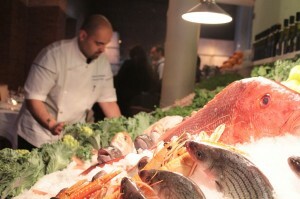 To the left, Chef Raphael Abrahante is perfects the seafood display. This guy really knows his fish. I feel like this guy is going to make a name for himself, but I can’t find a lot of articles about his food just yet. There will be more soon, trust me. It looks pretty, but I think it needs to be eaten when it’s hot. I had photographed all of the appetizers before I got to try it and the cooling off did something to the texture. I can’t comment on this one in one way or another, only to say that it needs to be eaten hot. 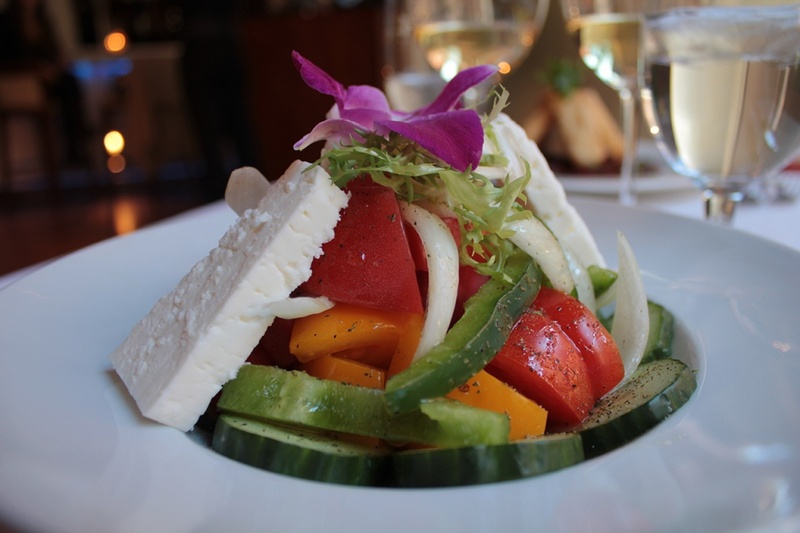 Or as I like to call it, the fancypants Greek Salad. I think I ate the whole thing. I might have skipped the flower. Look at how GD gorgeous that thing is. 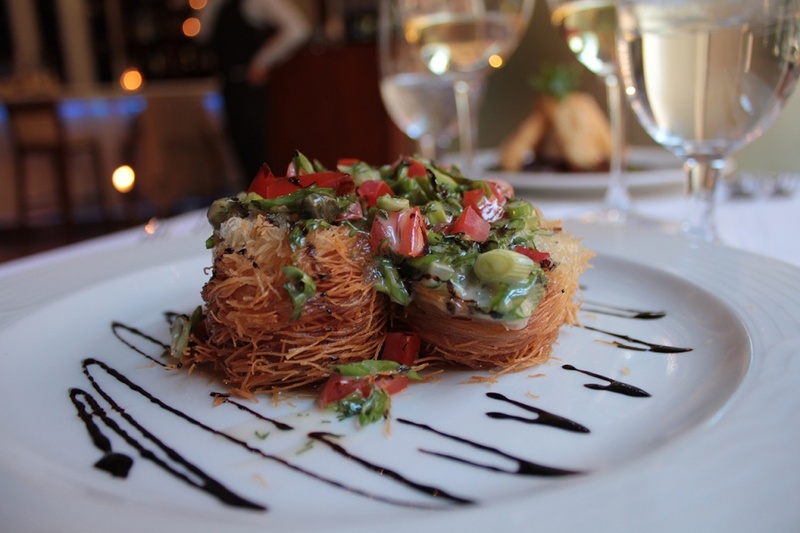 Maine Sea Scallops wrapped in Kataifi filo with sheepâ€™s milk butter and a Kalamata balsamic reduction. These things are a must order when you dine here. They are DECADENT, so beware. These are easily someone’s main course. A refined fried scallop dish if I’ve ever tasted one. 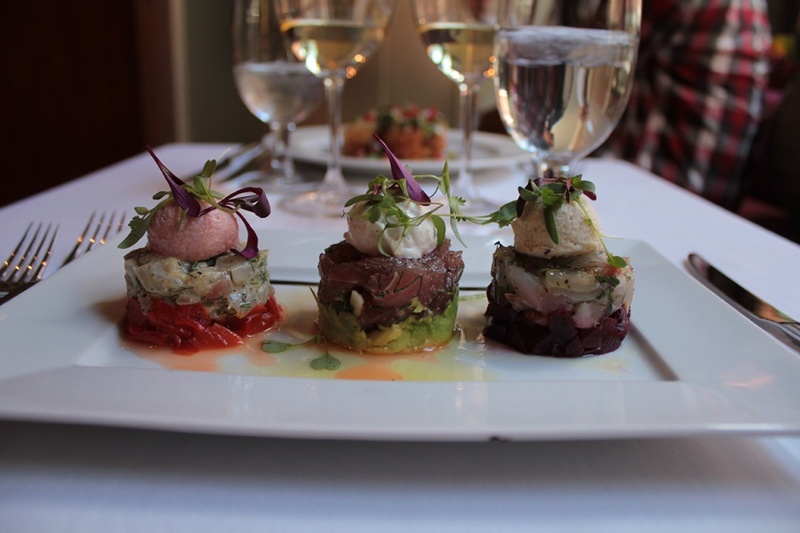 Three tartares of Royal Dorado, Tuna, and Lavraki respectively. My favorite was the classic tuna and avocado. Hard to go wrong with this light fare after you’ve punished yourself with those scallops (we advise splitting the scallops with two friends). This one is not on the menu right now, but I just wanted to say DAMN! 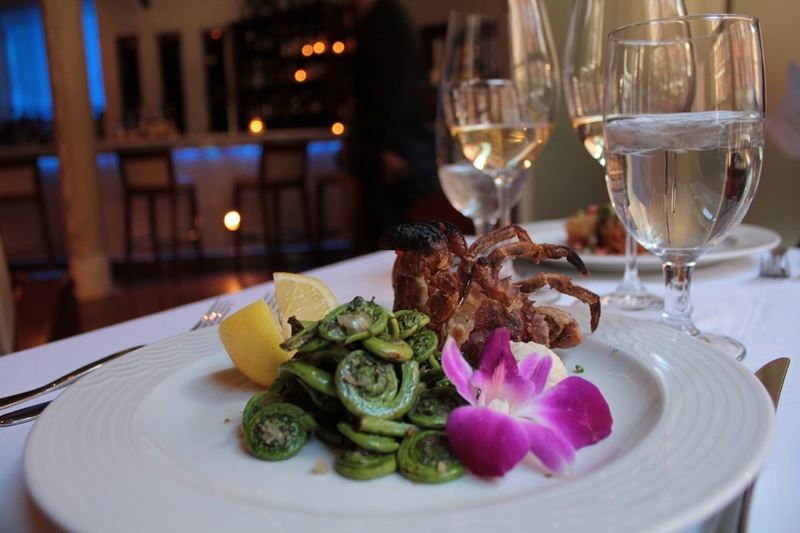 FIDDLEHEADS! If you haven’t had yourself some fiddleheads at this point in time this season, go find yourself some and cook the heck out of those badass mothers. You’ll LOVE them. Also, soft-shell crab? Definitely my favorite type of crab. If it’s on the menu, this is what I am ordering. Very springy. Susan was telling me a story about how all of the Greek restaurants used to have a washing machine in the kitchen. The washing machine would tenderize the octopus. Now, these washing machines have been removed from the great kitchens because they are “unsanitary.” I mean, I am guessing they are not made for this type of stuff, so they have the potential to be unsanitary, but I basically side with the chef on this one, especially in a restaurant of this caliber. These octopi were hand-massaged. They are plenty tender and you get an absolute mammoth portion of it. 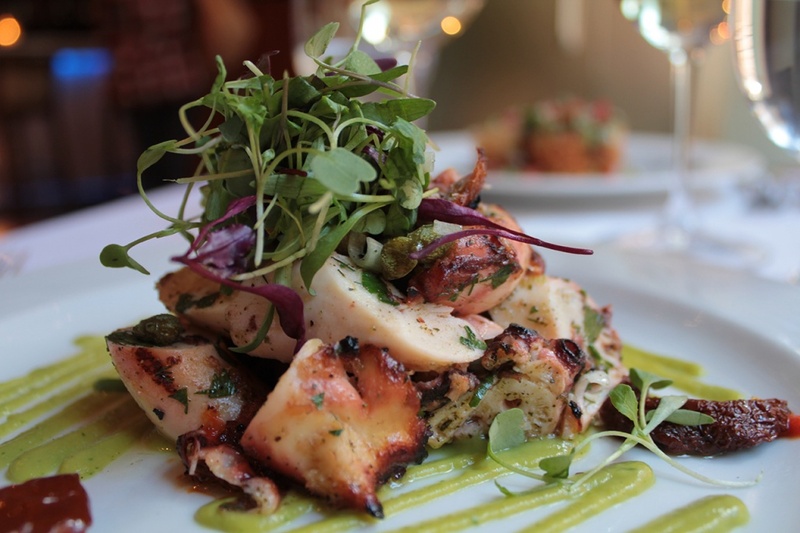 Not cheap, but if you like octopus, this really is an exceptional dish. 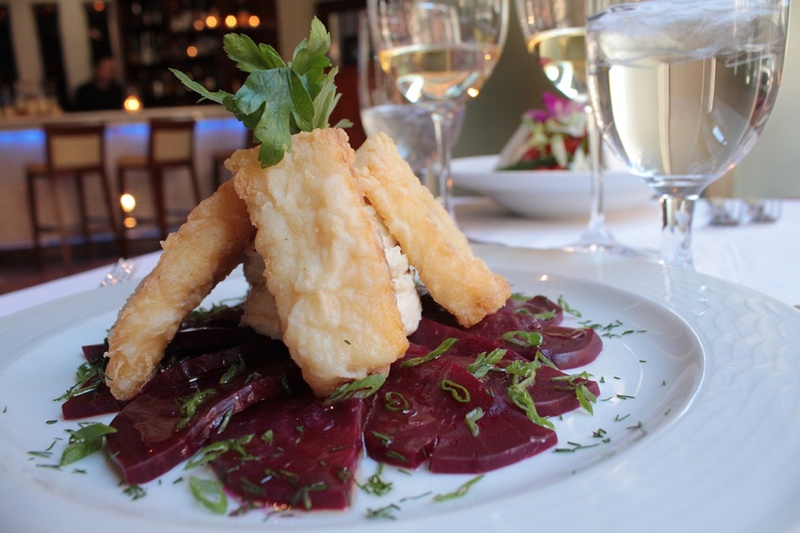 This one is available in the $38 prix-fixe. 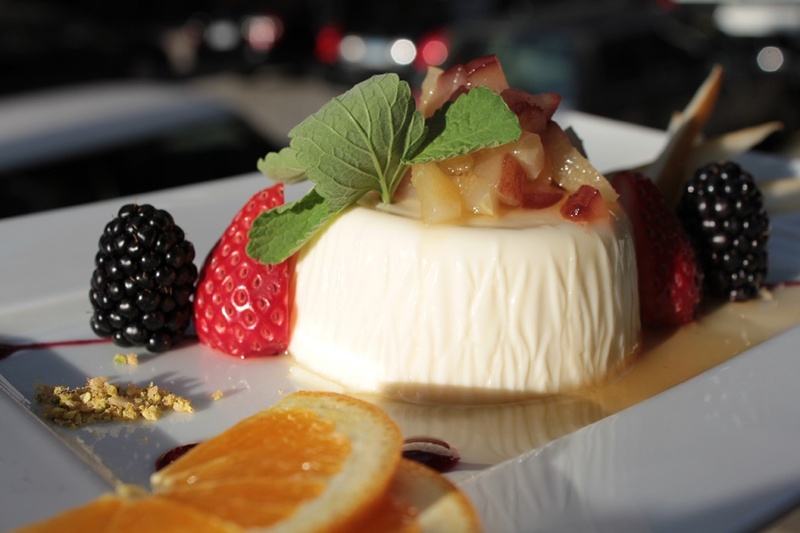 When I think Greece, I don’t typically think Panna Cotta, but I was happy with this one. Panna Cotta it is one of my favorite things to photograph. I’m not sure I did this one justice. I don’t think you could see it, but the honey was absolutely sparkling in the sunset. Sparkling honey is not necessarily a mark of good baklava, but they nailed it. 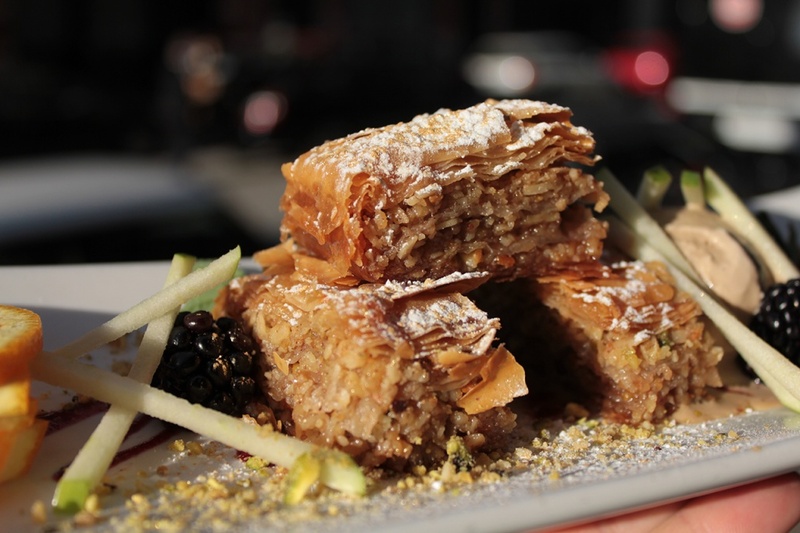 If you are a high-end Greek restaurant, you need to nail the baklava. An ex-girlfriend of mine went to Greece on a trip and came back complaining about the bland food. I’ve been to a lot of Greek restaurants in the past and I’ve never been super excited about the cuisine.